At Ahdoot, we have an interest far exceeding the Oriental rug market, collecting dozens of pieces originating from countries around the world. Our standard has been to appreciate the craftsmanship of every meticulously produced rug or textile available, giving us an opportunity to source handmade materials from a variety of experts in the market. As such, we’d like to introduce those who share our affection for exceptional artistry to the textiles of Peru. On the western portion of South America, bordered by Brazil, Chile, Ecuador and the Pacific Ocean, Peru has established itself as one of the more industrious societies in history. The country has an estimated population of over 30 million, primarily rooted in Amerindian and Spanish traditions, and dating back to the pre-Incan cultures. The Peruvian economy remains one of the fastest-growing in the world, placing 39th among other nations, by way of a productive exporting business that has kept it competitive. Much of these exports are derived from domestic products, with textiles playing a tremendous role in sustaining the economy alongside precious metals. Yet, the fabrication of textiles, for cultural or trade purposes, has been a tradition surpassing millennia. The Peruvian territory contains two of the most remarkable sites on Earth, housing both the Amazon Basin and Andes Mountain range. This is where much of the artistic practices began, introducing sophisticated pottery, jewelry, sculpture and textiles to neighboring countries for nearly 10,000 years. Textiles have played an important part in that history, often valued at more than silver or gold, in addition to signifying the political and social status of its residents. The skill of weaving is viewed as a sacred craft, utilizing cotton threads during production, though the use of alpaca and llama wool makes it unique among textile manufacturers. Unlike other weaving communities, the Peruvian process begins with women and children, who care for the sheep, llamas and alpaca herds. After collection, their wool is spun into threads using a drop spindle, and then delicately combined into skeins or balls of yarn. Afterward, the materials are washed with natural detergents, and later dyed with cochineal insects and Ch’illca leaves to a vibrant range of colors. Weaving the threads together consists of a grid-pattern, using a process that includes 4-post or back-strap looms central to the art. Similar to Persian rug making, Peruvians will often use wefts that serve as a supporting material for weaving. The warp is then beaten into the weft with a bone tool called the ruki, determining the pattern that will eventually become the finished product. 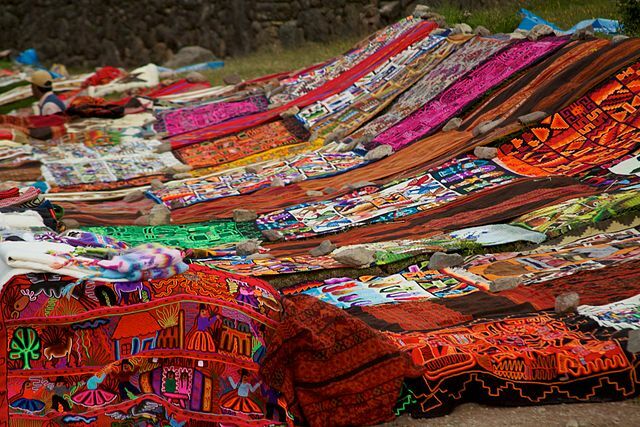 The symbols associated with textiles from Peru include animals, the sun, flowers, and limitless designs having been passed down for generations. They pay homage to the Peruvian way of life, displaying the area’s surrounding beauty, and telling a story that goes beyond familiar themes in other cultures.